We want to flood the halls of Congress with the sound of your voice and make it perfectly clear to YOUR Members of Congress that YOU want conservative champion Jim Jordan as the next Speaker of the House and Judge Brett Kavanaugh on the Supreme Court! America is at a critical crossroads. The choice of the next Supreme Court Justice & the next GOP House leader, will determine our future for years to come. Surveys show Jim Jordan would best attract the center while mobilizing conservatives to win in 2018 and beyond. Stand with us to demand Kavanaugh & Jordan. Register for a free bus ride. Limited Seating. 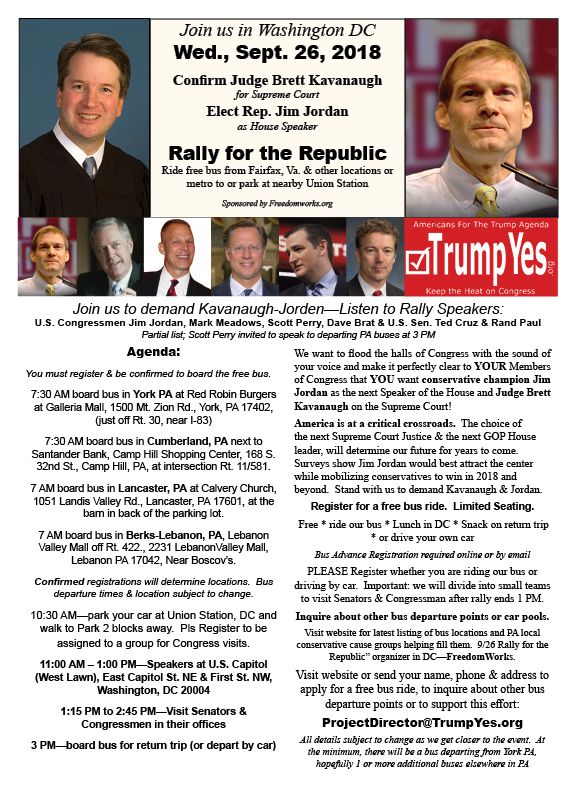 Click here for Pennsylvania buses to Rally for the Republic. Click here for Virginia buses to Rally for the Republic. The dems are playing very dirty, desperate politics. I am hoping and praying that the Republicans develop a spine and refuse to bow and scrape and kneel and play mother may I, before the dishonorable, bullying, power hungry dems. I am a former dem. My grandmother was a long time delegate, my cousin was assistant Sec. of Labor, under Clinton. I am very familiar with their machinations.